Pat 1 is the registration plate of Postman Pat’s first and enduringly iconic red delivery van. With its instantly recognisable Royal Mail red livery, Pat 1 was based on the popular Bedford HA van made by Vauxhall Motors from 1963 until 1983 when it was superceded by the Astravan. This ubiquitous light commercial vehicle gave sterling service to the Post Office as well as many other utilities in the UK. Its rear double doors made easy work of loading mailbags ready for delivery. The first toy version of Pat 1 was a die-cast model made by US farm toy specialist ERTL in the early 1980’s. This was revised and updated by Corgi. In the 1990’s Entertainment Rights (ER) released the first pull back and go Pat 1 in plastic featuring opening driver’s side and passenger doors. 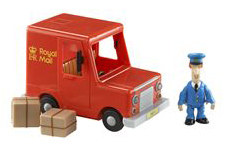 In 2009 Character Options released their new Postman Pat Special Delivery Service van, SDS Pat 1. 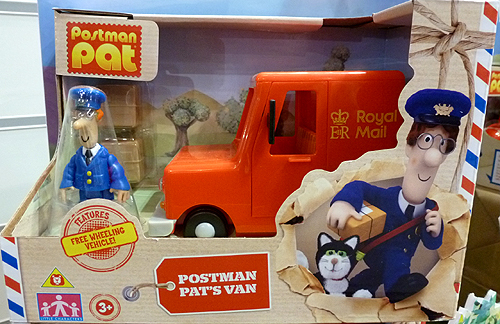 In 2013 the packaging was revised on Character’s line of Postman Pat toys, including Pat 1.